A south of the border classic. 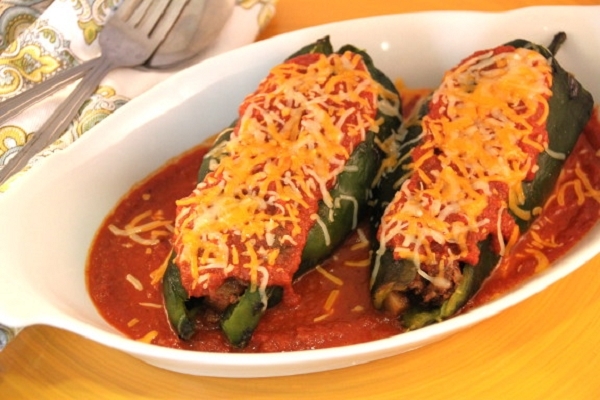 Fresh, slightly spicy poblano peppers stuffed with ground sirloin, potatoes, onions, carrots and tomatoes topped with cheese and warm tomato salsa. Baked, not fried, and served with Arroz Amarillo aka yellow rice. A cinch to prepare. This is my favorite so far. Wonderful flavors. More like this please! A surprise. These made for an excellent dinner. We would liked to have had a jalapeño cornbread with it, and recommend Maria add bread and other complimentary sides to the menu. The yellow rice was very good as well. 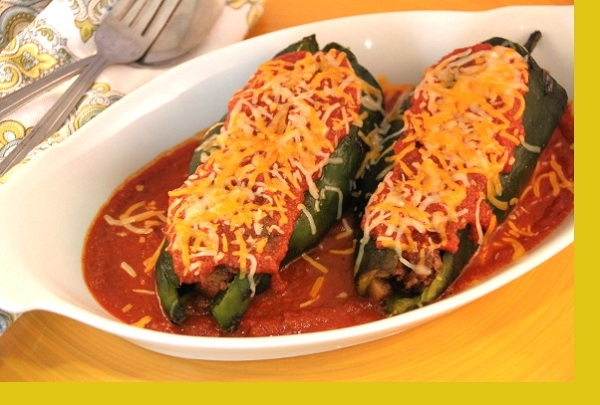 What an unusual yet so delicious poblano peppers stuffed with ground sirloin, potatoes, onions etc.. In 20 minutes my fresh, homemade dinner was ready thanks to Maria's Gourmet Kitchen!